Clocks of every kind can be found at our clock shop along with information and assistance from our experts and a clock repair service center for our customers. Welcome to Gift of Time Clocks. Our family-owned clock shop is an authorized dealer in some of the most sophisticated timepieces by some of the finest clockmakers from around the world, such as Howard Miller, Hermle, Ridgeway, Kieninger and Comitti of London. These timepieces make wonderful heirloom gifts that are perfect for any occasion and include free shipping within the Continental U.S. for online purchases. So feel free to browse our site or let our experts help you pick the perfect clock. 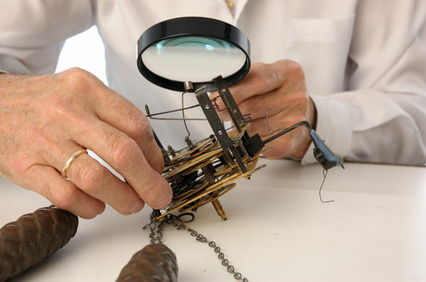 Along with being authorized dealers in sophisticated timepieces and offering antique clock repair, we also hold the distinction for being an authorized service center for some of the leading clock manufacturers in the world, such as Howard Miller, Ridgeway and Sligh. You can be sure that our staff has the knowledge and experience to provide the best in customer service and continued technical service support on many timepieces purchased from us. So browse the collections on our site or come visit our showroom and let us provide you with the "gift of time." You will soon discover what we feel makes our Wisconsin clock shop one of the more respected dealers and service centers in our industry. We feature, and can service, many of the timepieces from some of the finest clockmakers around the world. Indeed, you will find some of the biggest names in our industry represented here, such as Howard Miller, Hermle, Kieninger, Comitti of London, K. Mozer, Ridgeway, Timeworks, Hones, Hubert Herr, Hekas, Harzer and Rombach and Haas. 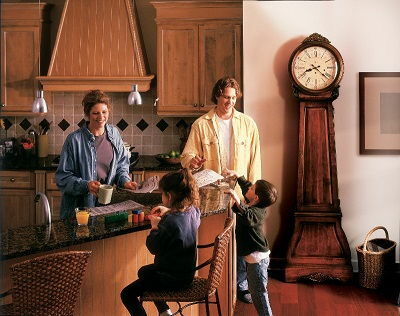 You can select from a variety of manufacturers' grandfather, cuckoo, wall and mantel clocks. 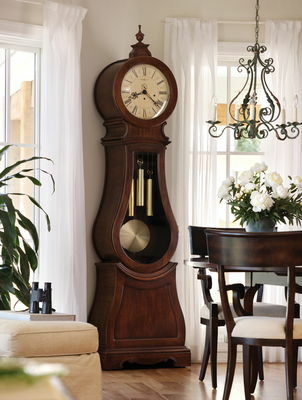 Styles offered throughout include many wind-up mechanical chiming mantel clocks and key-wound wall clocks. 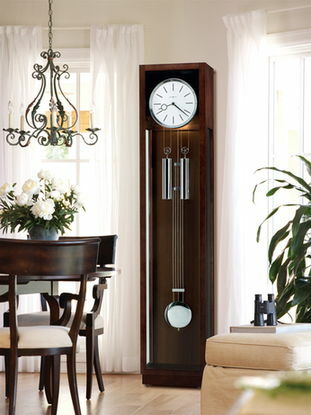 Clocks are our passion, which is why we have been providing the "gift of time" for nearly two decades. With these distinguished collections of traditional and contemporary grandfather, wall and mantel clocks, we're your one-stop source to shop for heirloom timepieces and fine gifts. Our site is also a source for clock information and clock repair and we try share some general information throughout our site. Indeed, you'll find some interesting details on each of your favorite clockmakers and a brief discussion on how clocks work, including the patriarch of such timepieces - grandfather clocks. Equally interesting is our overview on the history of clock chimes, which are found in many heirloom grandfather, wall and mantel clocks. You're sure to find your "gift of time" with our wide variety of fine timepieces and we hope you enjoy some interesting information on your favorite clock.